Want to ride your bike through Wallingford but fear the hazards on arterials? In 2011 you’ll have a safer way to get east-west through Wallingford — N. 44th Street from I-5 to Stone Way will become a bike boulevard that encourages cycling through the neighborhood and easy access to the N. 45th St. business district. The local cycling group Spokespeople, headed by Cathy Tuttle, just got word that the project will be funded through the Neighborhood Projects Funds (formerly Neighborhood Street Fund/Cumulative Reserve Fund). What is a Bicycle Boulevard? : Bicycle boulevards prioritize bicycles using the existing roadway. On bicycle boulevards, bicyclists are free to use the middle of the street, sharing road space with cars. Bicycle boulevards employ traffic calming techniques that significantly slow cars down, and drivers are discouraged from using a bicycle boulevard route for cut-throughs. Motorists on bicycle boulevards respond to signs, signals, and traffic calming devices, expect to see bicyclists, and therefore travel with caution. For new bicyclists and younger riders, bicycle boulevards provide a positive option to high-traffic shared roads. Bicycle boulevards are welcoming to children, families, and less able cyclists, and provide a more livable, healthy street environment for all neighbors and visiting pedestrians. Why this location? : There are several reasons this location was selected for the Wallingford Bicycle Boulevard Project. North 44th Street is one street off of Wallingford’s main arterial and business district, it connects the Wallingford middle school and elementary school, it is an area with a high density of families with children, it is corridor with less elevation change than other east-west neighborhood streets, and it is a road segment with many existing traffic circles. Tuttle told us that turning a street into a bike boulevard is relatively inexpensive, and may just require putting stop signs at every north-south corner along N. 44th St. She doesn’t yet know when work will begin on the new signage. Have you heard the news that we could get snow tonight and tomorrow morning? It won’t be anything like the blast we had last month, UW atmospheric scientist Cliff Mass writes in his blog, but the Seattle Department of Transportation (SDOT) is taking extra precautions to avoid a repeat of the icy streets we had in November’s storm. After 10 p.m. tonight SDOT crews will proactively apply salt brine in roadway areas where frost or black ice is prone to develop, especially on bridges and other elevated structures around the city. Starting at 4 a.m. tomorrow morning (Wednesday), SDOT spreader trucks will be prepositioned throughout the city, ready to spread rock salt on major arterial streets (primary snow routes, Levels 1 and 2) for the morning commute if conditions warrant. SDOT’s snow plan calls for plowing when there is more than one inch of snow accumulated on roadways, which is not part of the forecast at this time. ﻿This is a VERY, VERY different situation than November 22nd. You will not see a powerful arctic blast associated with strong high pressure in British Columbia and a major coastal low over SW Washington. Temperatures will be far more marginal. Far less icing potential. But there COULD be some interesting wrinkles….like a chance for Puget Sound Convergence Zone snow. If the Convergence Zone is stronger than forecast then more snow could hit the Puget Sound lowlands. However, forecast temperatures are predicted to peak near 40F on Wednesday. This looks marginal to me…only heavy precipitation and the cooling associated with it…something that is not predicted… could bring several inches of snow to Seattle. Read more on SDOT’s winter weather response plan and to view a map of snow routes here. A new year is mere days away, which means it’s time to toss that dog-eared 2010 calendar along with the leftover fruitcake. In an “out with the old, in with the new” spirit comes the Women of Wallingford calendar, which showcases a dozen of our fairer neighbors in photos that may shift people’s perception of Wallingford as a Danskos-and-fleece-only neighborhood. The calendar’s mastermind, Sarah Altman, said she had no intention to change Wallingford’s image, but “it’s nice to update it, make it more current, show a more youthful side.” She’d like to see people from from Fremont, the University District and other nearby neighborhoods to come up for the art walk, shopping, and so on. Altman, who works at Sea Monster Lounge, recruited her friends who live or work in Wallingford to pose for calendar, proceeds of which benefit the Wallingford Art Walk, Bargain Fair/Operation School Bell, and the FamilyWorks food bank. Next year more Seattle neighborhoods could see their own “Women of…” calendar. “My dream is that the project can expand into other neighborhoods,” Altman said. The Women of Wallingford calendar is available at Not a Number (1905N. 45th St.), Appasionato (1218 N. 45th St.), Sea Monster Lounge (2202 N. 45th St.), Rain Sushi (2208 N. 45th St.), Bottleworks (1710 N. 45th St.), and the Neighborhood Office (4504 Meridian Ave. N.) for $12. 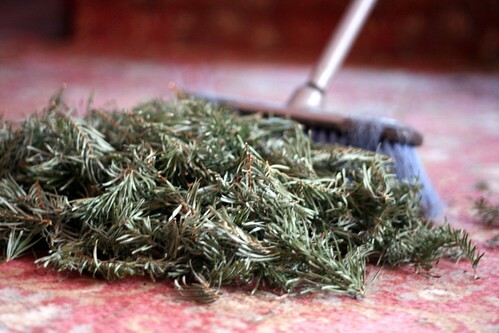 Seattle residents who subscribe to curbside food and yard waste collection can put their trees and greens out on their regular collection day at no extra charge beginning today (Sunday, Dec. 26, 2010) until Sunday, Jan. 9, 2011. Trees should be cut into sections of six feet long or shorter, with branches trimmed to less than four feet to fit into the collection trucks. Sections should be bundled with string or twine. Multi-family buildings can put out one tree next to each yard waste cart at no extra charge. Trees that are flocked and/or have tinsel or ornaments will be collected as extra garbage. Customers will need to cut the tree into three-foot pieces and each piece will be charged as extra garbage. Starting Jan. 1, each unit of extra garbage will cost $8.10. Plastic trees are not recyclable. Seattle residents can also drop off their holiday trees and greens for free at Seattle Public Utilities’ North and South Recycling and Disposal stations between Dec. 26 and Jan. 9. The tree sections must be cut to eight feet or less in length and the trunk must be four inches or smaller in diameter. The limit is three trees per vehicle. Only trees without flocking or decoration may be disposed free of charge. The North Recycling and Disposal Station (1350 North 34th St) and South Recycling and Disposal Station (130 S Kenyon St) are open from 8 a.m. to 5:30 p.m. every day except for Christmas and New Year’s Day. What was that singing in Wallingford? The voices you heard were from the Seattle Girls’ Choir – Prime Voci. Here’s video from last year’s finale. If you have pictures or video to share from last night, let us know at tips@mywallingford.com. Wallingford may not have a Candy Cane Lane, but it does have some homes that are impressively lit for the holidays. We found these enchanting photos from 4059 Latona Ave. on Flickr. Thanks to Andre Ferrer for giving us permission to post them. He has more on his Flickr page. Have pictures of your own festive house or others in the neighborhood? Send them to tips@mywallingford.com to share them with our readers! You know the drill — you’re cooking up Christmas dinner and discover you’re on your last splash of oil or your final teaspoon of sugar. Or you’re heading to someone’s house and realize you haven’t picked up the wine you promised to bring. Here’s a guide to that’ll help you avoid some disappointment. If you know of anything else open on Christmas Day, please post in the comments or email us at tips@mywallingford.com. Durn Good Grocery will be open 9 a.m. to 5 p.m. Christmas Day (4002 Wallingford Avenue N.; 633-0500). Hitting the road Christmas morning? Fuel up at Fuel Coffee from 7 a.m. to 1 p.m. Fuel closes at 5 p.m. Christmas Eve (1705 N. 45th St.; 634-2700). Tully’s will be open from 7 a.m. to 4 p.m. on Christmas Day, and closes at 5 p.m. on Christmas Eve. (2100 N. 45th St.; 632-5259). Chutneys Bistro is open 11 a.m. to 10 p.m. on Christmas Eve and Christmas Day (at Wallingford Center; 634-1000). Bamboo Village is open 10:30 a.m. to 10 p.m. Christmas Eve and Christmas Day (4900 Stone Way; 632-8888). Moon Temple is open Christmas Eve until 11 p.m. (the bar will stay open till 1 a.m.) and from 4 to 10 p.m. on Christmas Day. The bar will be open until 2 a.m. on Christmas (2108 N 45th St.; 633-4280). Murphy’s will be open regular hours, noon to 2 a.m., on Christmas Eve and Christmas Day (1928 N. 45th Street; 634-2110). Julia’s will be open regular hours, 7 a.m. to 10 p.m., on Christmas Day (1714 North 44th Street; 633-1175). QFC will be closed on Christmas Day and will shut its doors at 6 p.m. on Christmas Eve. The nearest open QFC on Christmas Day will be at U Village. Bartell Drugs will stay open until 8 p.m. on Christmas Eve and the prescription window will close at 6 p.m.
Tweedy and Popp will close at 5 p.m.
Planning on cupcakes this Christmas? Trophy will close at 5 p.m.
Zoka serves its last cup of caffeine at 5 p.m.
Mighty-O will be open until 2:30 p.m. Buying for Santa? Tell them and you’ll get 10% off a dozen donuts on Christmas Eve. Essential Baking sells its last loaf at 5 p.m.
Wine World will be open until 6 p.m.
City Cellars will close at 5 p.m.
Starbucks closes at 5 p.m.
Irwin’s is closing at 2 p.m. This article is from our sister site My Green Lake. As a result, Seattle Parks and Recreation has been asked by the City Council to re-think how community centers are operated. This process will include public meetings and the creation of a Community Center Advisory Team. Seattle Parks and Recreation is looking for community members to participate on the Advisory Team. Advisory Team meetings will occur twice a month from January to May, 2011. The team will be exploring innovative ideas for operating the City’s community centers. Team members will consider the way the centers currently operate, review what other cities are doing, consider alternative operating models, evaluate public input, and assess options for partnerships. Ultimately, the Advisory Team will review and provide advice on the report that Parks will submit to City Council by June 1, 2010. In addition to representatives from the general community, members of the Advisory Team will include representatives from the Board of Park Commissioners, representatives of employee unions, employees, theAssociated Recreation Council, and City Council and City Budget Office staff. Seattle Parks and Recreation is currently seeking community applicants for the team. Those interested in serving on the Community Center Advisory Team are invited to apply. Parks is especially interested in those with past involvement with a community center, and those who are able to work in concert with others for the greater good. Applicants are asked to submit their statement via e-mail to Susan Golub: susan.golub [at] seattle.gov. The deadline is Monday, January 10 at 5 p.m.